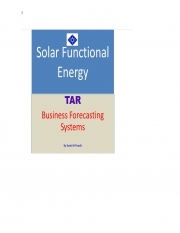 Description of "Solar Functional Energy (eBook)"
Forecasting of business trends in any market is big subject. Solar Functional energy attempts to find the most intelligent solution of this big problem through space electricity stored by Saturn and Jupiter planets in the solar system and carried by sun rays to earth. Saturn emits electrons which are the negative charge of electricity and Jupiter emits protons which is the positive charge of electricity. They together form productive energy for growth and development on earth. The third element - the Resistant factor put checks on smooth flow of this energy and causes down trend. These three energy factors work continuously to produce trends in the economy and business world. Solar Functional Energy through TAR modules is able to track these factors and indicate about market trends with clarity. There is innovativeness in the approach and anyone with patience can master it in few days. The application has been tried in more than 3000 cases of economic development in US economic history, Japan, India and china. All these events have been found to be correctly responding to TAR module formed then. The module answers correctly why business cycles occur in the global economies. what is the reason behind the Great Depression? When business cycles again may recur?This book 'Solar Functional Energy will enable readers to foresee and forecast business development trends objectively based on the energy profile generated by space electricity. There is no scope of subjective assessment or guesswork. Once the reader masters the first basic rules of TAR he can take up advanced forecasting system to be presented later in the next part of the same book. The author is an honors graduate in economics and possess certificate in marketing management from IIMC India with background in Science. He is a life member of ‘Astrological Research Project’ Calcutta. After a long experience in executive positions in reputed multinationals he stepped into the world of Forecasting of global economic events. The authentic path he chose was that of Astrology. But he was not satisfied with the contents of Astrology as far Business or economic forecasting was concerned. He tried to find a better answer to the problem of Business forecasting. He stepped in to the world of Science and through rigorous research for 14 years could relate business and economic world with ‘Space electricity’ in which the planet Saturn and Planet Jupiter have the principal role to play as major source of the basic electrical constituents of negative and positive charges. I related the finding to industrial developments in US economy for 300 years and other economic events in the world. To my surprise the economic events responded to the formation of universal electrical currents on earth created by Saturn and Jupiter and carried by Sunrays to us through conductors on earth including our brain. The finding has been published in ‘Thunderbolts’ Forum for Scientists to discuss ‘Electrical Universe and Plasma Cosmology’ Rest is your close encounter with facts and analysis in the following work. Reviews of "Solar Functional Energy (eBook)"